BOULDER, Colo. — Coastal cities worldwide would face a reduced threat from sea level rise if society reduced greenhouse gas emissions, with especially significant benefits for New York and other U.S. East Coast cities, new research indicates. The study, by scientists at the National Center for Atmospheric Research (NCAR), used a powerful computer model to tease out the ways that winds and currents in a warming world push ocean water around, lifting it in some regions and lowering it in others. The scientists examined how these variations in sea level rise would change under two conditions: if emissions continue on their current trajectory, or if they are sharply reduced. The results showed that, if society can implement cuts soon on emissions of carbon dioxide and other heat-trapping gases, the projected increases in sea level around the globe would be significantly less toward the end of the century. This would help coastal cities in much of the world as they try to fend off rising waters, with the benefits most pronounced for cities on parts of the Atlantic and Indian oceans. 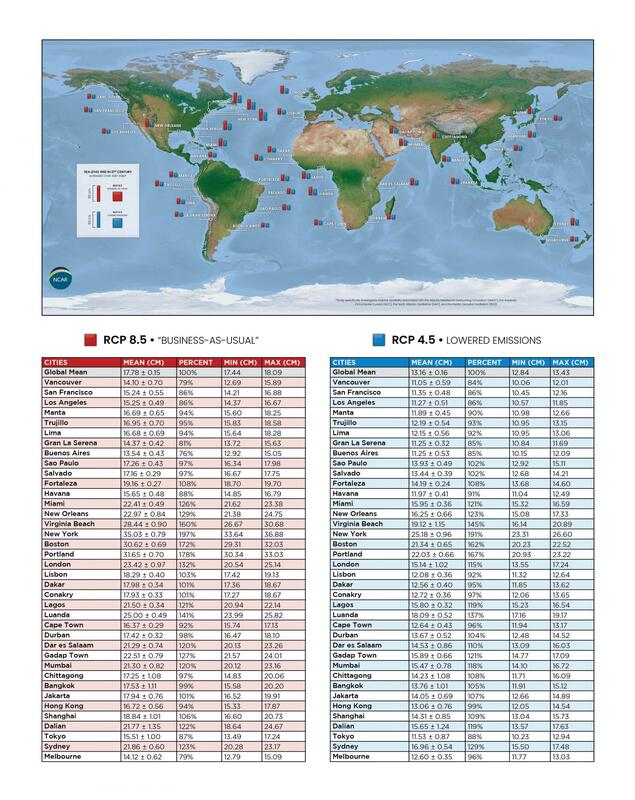 "Mitigating greenhouse gases will reduce sea level rise later this century, with some regions seeing especially significant benefits," said NCAR scientist Aixue Hu, the lead author of the new study. "As city officials prepare for sea level rise, they can factor in the compounding effect of local conditions, which are due to the winds and currents that cause internal variability in the oceans." Hu and his co-author, NCAR scientist Susan Bates, caution that the modeling study presents an incomplete picture, because it does not include runoff from melting ice sheets and glaciers — two factors that scientists are just now incorporating into computer models. Instead, it simulates the influence of climate change on variations in sea level worldwide to reveal which coastlines will benefit most from emission reductions associated with the additional heat absorbed by the ocean. The study, published this month in the journal Nature Communications, was funded by the U.S. Department of Energy and by the National Science Foundation, which is NCAR's sponsor. Sea level rise is one of the most consequential impacts of climate change, threatening to swamp low-lying islands and major coastal cities. Sea levels in some regions are expected to rise by several feet by the end of this century, due to a combination of melting ice sheets and glaciers (which account for about two-thirds of sea level rise) along with thermal expansion, or ocean waters expanding as they warm (which accounts for the remaining one-third). To study how changes in emissions would affect global sea level rise and local variations, Hu and Bates used two sets of computer simulations that are based on two different greenhouse gas scenarios. In the business-as-usual scenario, with emissions from human activity continuing to increase at current rates, global temperatures by late this century would rise by about 5.4 degrees Fahrenheit (3 degrees Celsius) over late 20th century levels. In the moderate mitigation scenario, with society taking steps to reduce greenhouse gases, warming would be held to about 3.2 degrees F (1.8 degrees C). The scientists found that reducing greenhouse gas emissions would not significantly restrain sea level rise for the next two decades. The reason, in part, has to do with the inertia of the climate system (once heat enters the oceans, it is retained for a period of time). In addition, winds and currents are naturally variable from year to year, pushing ocean water in different directions and making it hard to discern the full impact of planet-scale warming over the span of a decade or two. But the scientists found that later in the century, from 2061 to 2080, reduced emissions would have a significant impact across almost the entire world. The simulations showed that the extent of mean global sea level rise from thermal heat expansion (but not runoff from melting ice) was reduced by about 25 percent, from about 17.8 centimeters (7 inches) in the business-as-usual scenario to 13.2 centimeters (5.2 inches) in the moderate mitigation scenario. For some cities, the benefits of the lower-emission scenario would be especially significant. New York City, where sea levels this century are expected to rise more than almost anywhere else in the world, would see a difference of 9.8 centimeters (3.9 inches). Other cities that would see a greater-than-average reduction include Boston (9.3 cm/3.7 in), London (8.3 cm/3.3 in), Dar es Salaam (6.8 cm/2.7 in), Miami (6.5 cm/2.6 in/), and Mumbai (5.8 cm/2.3 in). On the other hand, some cities in South America (such as Buenos Aires), Asia (such as Bangkok and Jakarta), Australia (such as Melbourne), and the west coast of North America (such as Vancouver and San Francisco) would see lower-than-average benefits. And reducing greenhouse gases would have no statistically significant effect on sea level rise along the western coasts of Australia and the Philippines. The reason for the local differences in sea level rise has to do with the influence (or lack thereof) of a changing climate on major currents and on atmosphere-ocean interactions around the globe. In the northern Atlantic, for example, warming temperatures are expected to weaken the Gulf Stream that transports warmer water from the subtropics to the Arctic. The powerful current draws water away from much of the east coast of the United States, and scientists have warned that a weakening current would send those waters back toward the coastline and significantly raise sea levels. If actions taken by society resulted in reduced emissions, the Gulf Stream would be less affected and, therefore, sea level rise in the north Atlantic would be less substantial. In contrast, the currents in some other ocean basins appear to be less sensitive to climate change. Across much of the Pacific, for example, sea levels are influenced by the Pacific Decadal Oscillation, a phenomenon related to winds and sea surface temperatures. Although climate change is affecting winds and causing sea surface temperatures to rise in the Pacific, it is not disrupting currents there as much as it is in the northern Atlantic. As a result, climate change mitigation that reduces thermal expansion would generally have a less significant effect on Pacific sea levels. The study also found greater variations in future sea level rise in different regions, including some cities where local sea levels are influenced by the Pacific Decadal Oscillation or by an Atlantic climate pattern known as the North Atlantic Oscillation. As a result, the projected sea level rise in the model varied more for London and Tokyo than for New York. "City planners in some places will be able to make decisions based on more certain sea level projections, but for other places it's going to be more difficult to know what the sea levels will be," Bates said.